Boat Roller Ramp | Boat Ramp Accessories for 2600# Cap. | VE-VE Inc.
BRA-300; 8' Aluminum "Extra Section"
The BRA-300; is a 8' long Aluminum "Extra Section" for the DDA-3000. Extra section easily adds on to ramp. NOTE: TO VIEW PHOTO ENLARGEMENT AND MORE PRODUCT INFORMATION, CLICK ON IMAGE OR DETAILS. BR-20; Boat Ramp "Support Kit"
The Boat Ramp "Support Kit"; 1 pr. pipe clamps ( For 1-1/4" Pipe ( 1-5/8" O.D Pipe ) that mount to "Boat Ramp" side tubes & 1 pr. of 8" square Base Pads ( For 1-1/4" Pipe ( 1-5/8" O.D Pipe ) (NO pipe included). Hole in center of Base Pad allows pipe to go threw for extra Boat Ramp support if desired. Galvanized finish. Sold as a pair. BR-26; Boat Ramp "Anchoring Kit"
Electric winch "Mounting Plate". 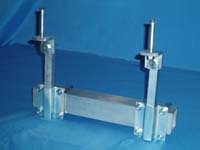 Fits 2” wide winch post, and comes with all mounting fasteners. (NO winch). Mounting Tube for VE-VE “Guide-Ons” use on Boat Ramps. 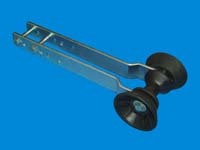 Accessory Mounting tube can be used to mount Post, Roller or Bunk style Guide Ons. 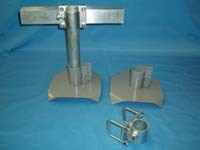 Shown with optional T-945-G; 47" Galvanized "Post Guide Ons". The BR-28 is shown mounted on a Boat Ramp. 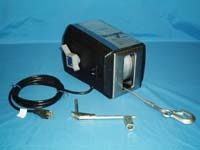 "Electric Winch" designed especially for Boat Ramps with 90 ft. of 7/32 aircraft cable. Power in, power out, controlled freewheeling clutch, and automatic brake. T-992-16; "BOW STOP ROLLER ASSEMBLY." ( For 2" Wide Winch Post ). Comes with 3" wide Bow Roller with End Bell Roller Caps, Mt. Brkts. & Fasteners. Mounts on to 2" Sq. & 2" wide x 3" Winch Post. Note: Rollers are actually BLUE, not black as shown. "HOT DIPPED GALVANIZED FINISH" available ( mainly for SALT WATER !! ), Click on "DETAILS" for option. The BR-59; "Installation Wheels Kit" consist of 2 (24" Dia.) wheels, 1 Axle, 2 Axle Mt. Brkt's. and all mounting hardware. It mounts to side tubes and allows for easy Ramp installation and removal. NOTE: For 52" ( or less ) wide Ramps ONLY!. The BR-59 is shown mounted on a Boat Ramp. 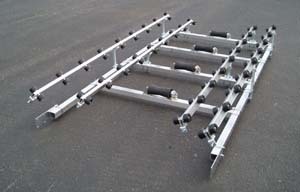 "Section Disconnect Kit" for DDA-3000 aluminum Boat Ramp. NOTE: Both sets of Roller bunks need to be mounted on cross tubes to use the "Disconnect Kit" ( NOT 1 pr. on side tubes as shown on DDA-3000 picture. ) This Picture is the BRA-54; "Disconnect Kit" for the DDA-2000 and only shows 1 set of roller bunks mounted on the cross tube. BR-90; Installation Tow Hitch. Shown mounted to front of Boat Ramp. Most commonly used in conjunction with BR-58 / BR-59; Installation wheel kit. NOTE: NOT TO BE USED WITH WATERCRAFT ON RAMP. Ramps longer then 24 ft. long may need 2 ea. Installation wheel Kits so weight of Ramp does not cause damage to Ramp or Tow Hitch. 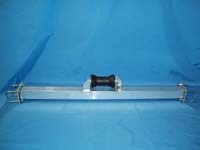 BRA-65; Boat Ramp "Aluminum Cross Tube"
Aluminum "Cross Tube" with 8" keel roller and mounting fasteners for all 52" wide ALUMINUM Boat Ramps. NOTE: The picture is of a 36" wide cross tube that only has a 5" keel roller. BR-80; "Roller Bunk Uprights", 1 Pr. of clamps, 3/4" sq. uprights, support angles and all mounting hardware. NOTE: Aluminum tube in picture is for displaying purpose only. The BR-727-16; "Roller Assembly" works on all VE-VE Inc. Boat Ramp Roller Bunks or Trailer Roller Bunks . Assembly includes 2 ea. Side Rollers, 2 ea. Lg. Washers, 2 ea. Sm. Washers, 1 ea. Clevis Pin & 1 ea. Hog Ring. To Order 2 ea. Rollers ONLY "CLICK HERE". BR-20-1A; 1 Ea. Pipe Mount Bracket with 2 ea. U-bolts & nuts. ( For 1-1/4" Pipe ). 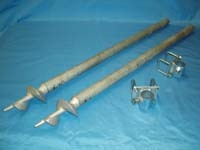 Used on the BR-20; Support kit & BR-26; Anchor Kit.